There’s nothing better than watching flowers come in to their full beauty in the summer months, and you wouldn’t be alone for wanting to transfer some of this beauty inside. Putting together a summer bouquet is a great way to get some of the outdoors indoors, brightening up your interior or as a gift to friends and family. As a gift, a summer bouquet put together with your own fair hands would mean infinitely more than a shop bought bouquet, so here are four easy steps to make the most of your summer blooms. Choose your blooms – The first step in creating a great summer bouquet is to choose the perfect flowers for the job. It’s a good idea to select a colour scheme that can reflect the beauty of the summer months. Once you have got your design down you can begin preparing your flowers. Carefully trim the ends and prune the leaves so the stems can be easily joint together without any unattractive extras sticking out. Centerpiece – Once your flowers are prepared you need to think about the arrangement. For this purpose you need to select a showstopper to act as a centrepiece, a flower that can draw the whole bouquet together. It doesn’t need to be placed completely central but it does need to be able to draw the eye to the arrangement. Build it up – Once you have selected your show stopping centrepiece you need to begin to build up the bouquet. Start to incorporate different colours and textures with your chosen blooms. These don’t always need to be flowers, you can incorporate some interesting additions in the form of twigs, closed buds and sprouting foliage to give some star quality to the piece and clearly identify it as an individual and handmade bouquet. The final step – When you are happy with the arrangement of your bouquet you need to set it in place. 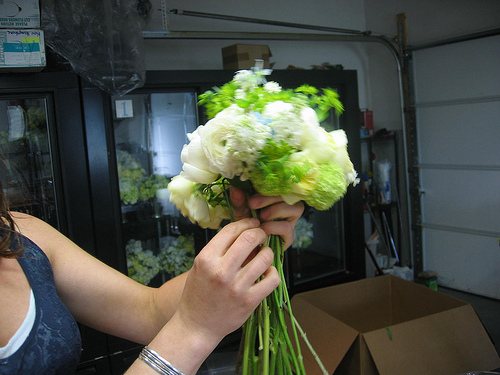 To do this, hold the stems firmly and twist in to a spiral so the bouquet can hold its form. Next you need to cut your stems, in order to make sure that your flowers can gain maximum water exposure you should cut your stems at a 45 degree angle. This technique will allow your flowers to stay hydrated and last longer. To give your bouquet that personal touch bind everything together with some twine or an attractive ribbon. If you are planning on giving the bouquet as a gift you can also add a cute little tag at this stage with a personalised message that reflects the beauty of the bouquet. So there you have it, 4 simple steps to creating the perfect summer bouquet. Next time you find you kitchen looking a little bare and think some flowers would brighten the place up instead of heading down to your local florist or supermarket, head out to your garden instead. You’ve planted those flowers for a reason so make the most of them.